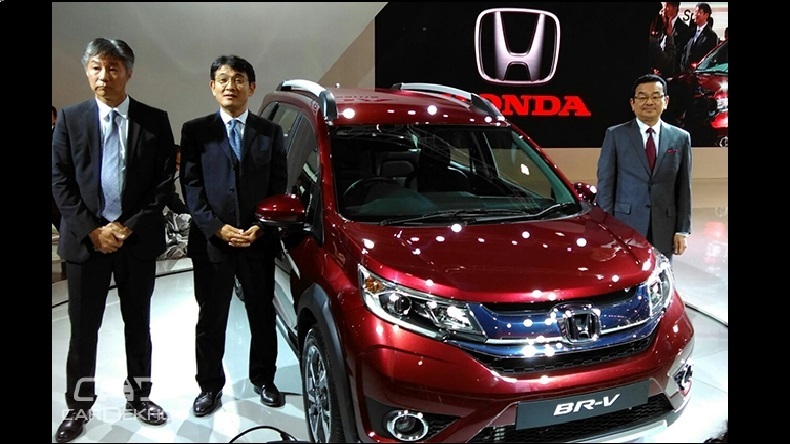 Honda Cars India, today, launched the much-awaited compact SUV – Honda BR-V – in the country. Priced between Rs 8.75 lakh – Rs 12.90 lakh, the BR-V will take on the Renault Duster, Hyundai Creta, Nissan Terrano, Maruti Suzuki Vitara Brezza and Mahindra Scorpio. First unveiled at the 2015 GIIAS and IIMS in Indonesia, Honda’s new compact SUV is based on the extended Brio platform, and carries ‘Active Solid Motion’ design philosophy. Engine options on offer will be a 1.5-litre i-VTEC petrol and a 1.5-litre i-DTEC diesel. While the petrol engine is available with two transmission options – a 6-speed manual and a CVT (with paddle shifters), the diesel gets a 6-speed manual gearbox. The petrol mill serves 118bhp of power with 145Nm of torque, while the diesel mill is good for 98.6bhp and 200Nm. Honda claims that the BR-V diesel returns a class-leading mileage of 21.9kmpl, and petrol variant offers 15.4kmpl (MT) and 16kmpl (AT). Honda’s new compact SUV measures 4,455mm in length, 1,735mm in width and 1,666mm in height, thus making it longer, wider and taller than its rivals. The vehicle is claimed to offer best-in-class cabin and boot space (691-litres – third row folded) along with a class-leading ground clearance of 210mm. With a long wheelbase of 2,662mm and a versatile seven-seat 3 row layout, the BR-V provides ample room to its passengers. As far as the safety is concerned, the Honda BR-V offers dual airbags as standard feature, while the anti-lock braking system (ABS) is available from the mid-range diesel variants and higher petrol variants. Other safety fitments on offer are – vehicle stability assist (VSA), hill start assist and, etc. The car also comes equipped with a multi-information display, push button start, steering-mounted audio buttons, Bluetooth telephony and audio streaming, automatic climate control and many other features. As far as the safety is concerned, the Honda BR-V offers dual airbags as standard feature, while the anti-lock braking system (ABS) is available from the mid-range diesel variants and higher petrol variants.